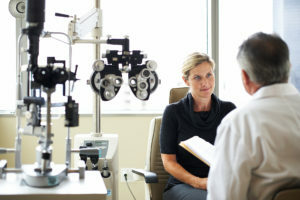 Home » Blog » Are you Seeing the Right Eye Doctor? Your vision is something that you want to protect as much as you possibly can. When “all is well” on the home front of your eyes, you may not even think about seeing an eye doctor. Typically, we only call a doctor when a suspicious symptom has us worried. Regarding your general health, and also regarding your eye health, routine checkups are important. The question is, who do you see when you want to know more about your eyes. Whom you choose to manage your vision and eye health is not an either/or choice. In some cases, patients have an optometrist who performs visual exams and facilitates prescription eyewear, and they also have an ophthalmologist who follows them for a condition such as cataracts. This is referred to as co-management, and it is something that we engage in because Roholt Vision Institute has been established with a focus on diseases of the eye and surgical treatments for vision problems. Both the optometrist and the ophthalmologist are referred to as an eye doctor. However, the educational background from one to the other is quite different. Knowing this can help you discern the best route for your needs. An optometrist is a Doctor of Optometry or OD. This degree demonstrates the completion of an undergraduate program as well as a four-year optometry program. This education allows the optometrist to provide vision correction with eyeglasses and contact lenses. Optometrists are also capable of treating certain eye conditions, such as mild infection or dry eye, with appropriate medication. An ophthalmologist has gone to medical school after the completion of a four-year undergraduate degree. This medical doctor then completes an internship and residency in a hospital setting. This additional four-years of hands-on training involves hundreds of surgical procedures and non-surgical treatments for potentially serious eye diseases. At Roholt Vision Institute, patients benefit from our extensive medical training and continued education in innovative vision-improving treatments such as LASIK and laser cataract surgery. Learn more about our services, or schedule your visit by calling us in Canfield, N. Canton, or Alliance.